This big Sled loves light wind, and the smoother the better. With a little patience, I did get it high up in an inland thermal once, but you will really enjoy it more down at the beach. Or any other wide open space with few obstacles to mess up the airflow. Sleds are so simple - no rigging at all, apart from attaching your flying line with a Lark's Head knot. About 2 seconds work! My most enjoyable flights have been in very light air, where it was just enough to climb this kite out. This often happens near sun-down. When finished, and the line is disconnected, this kite just rolls up into a super-slim package that can be stowed anywhere. I guess you could even stick this rolled-up Sled down a backpack and take it with you on a hike! The photographs are larger with better detail. Free of live web-page restrictions on size and quality. Being a PDF document, it lets you obtain nicely formatted printouts of the instructions. If you have a laptop or tablet, you may prefer to work directly from the screen. Down in the shed or spare room. In addition, the e-book has some handy tips and mods that you can try, to get the very best flying out of this big Sled. *** A kite twice as high and with roughly 4 times the sail area of the Dowel Sled. *** An Allison-style design that is almost collapse-proof. 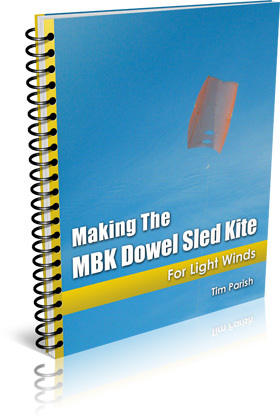 *** When de-rigged and rolled up, this kite is the same length as the Dowel Sled package! You've got little to lose, thanks to the money-back guarantee on all products. Valid for 60 days, after purchase. "Every new kite is an adventure"